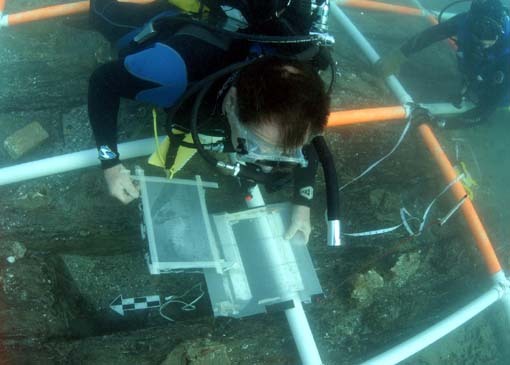 Conference on shipwrecks in Dominican waters attracts attention of attendees. From left to right, Dario Genao, Genaro Rodriguez, Dr. Simon Spooner, Tony Cord, Flavia Disla and Genaro Peña. With a massive turnout of over 600 students and teachers who attended at the Regional Center Auditorium University of Santiago (CURSA-UASD), a conference of historic shipwrecks in Dominican watersand their contributions to the Social Science Research. The days lectures was given by the Maritime Archaeologist Dr. Simon Spooner. Spooner's dissertation revolved around raising awareness of the great treasure we have in our marine estate, which tells our story through the various journeys made from the old world, was emphatic in stating that we own the most beautiful tropical coasts that do not exist in Europe. In the words of Dr. Genaro Rodriguez Martinez, director of the Center, "science is a single and separate for better research and development of such" external purposely words of the question of a law student who drew special attention those present for their content. Some of the objects found in shipwrecks dating from the fifteenth century. The teacher explained Flavia Disla legal part corresponding to the membership of the objects found in sunken ships dating from the time of the French occupation and today are of great historical significance for our country and our culture. After the lecture teachers and students observed the old pieces that have been extracted from the coast of Monte Cristi and are shown as supporting the conference. Dr. Simon Spooner works to serve as an advisor to the government of the Dominican Republic.